Experienced airbrushers who demand absolute precision and unmatched extreme detail spray choose the Iwata Custom Micron Series airbrushes. Specialized machining processes along with meticulous custom-matched head systems create a one-of-a-kind airbrush experience with superb handling and superior atomization. Replacement Head Systems are tested and tuned to the same standards to ensure that Custom Micron will maintain its precision over time. The ergonomic main lever is comfortable to use and the preset handle allows you to set the spray output, which increases your control while reducing finger fatigue. Iwata's spring-steel needle resists breakage and our needle packings are solvent resistant for longevity. If you like to remove the crown cap, you will appreciate Custom Micron's crown cap dock, which stows the cap when not in use. 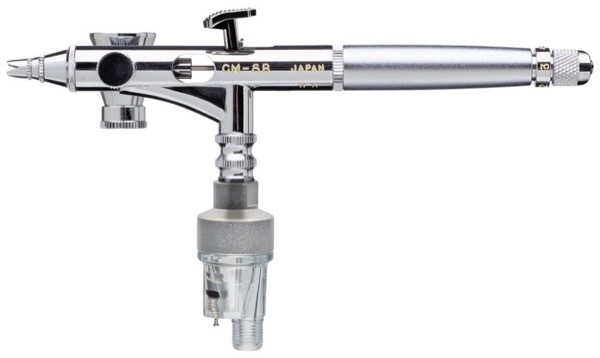 Each airbrush includes Iwata Lube, which is used to lubricate the head needle and main lever mechanism. Also included is an Iwata pistol-grip filter that collects and evacuates moisture build-up, helping to ensure that your Custom Micron receives clean, dry air. An Iwata nozzle spanner is included and may be used to remove the head nozzle. Store your Custom Micron in its durable aluminium storage case. If absolute precision is what you are looking for, Iwata Custom Micron is a one-of-a-kind airbrush experience. The CM-B Gravity Feed Dual Action airbrush features a 0.05 oz / 1.50 ml fluid cup that is ideal when using small amounts of spray medium. The CM-SB Side Feed Dual Action airbrush features a 0.4 oz / 1.25 ml fluid cup, which is adaptable to right and left handed use and is ideal when using small amounts of spray medium. One of the benefits to side feed is that it allows maximum visability of the spray surface while working. The CM-C Gravity Feed Dual Action airbrush features a 0.24 oz / 7 ml fluid cup with lid that is ideal for color mixing. The CM-C Plus Gravity Feed Dual Action airbrush features a 0.24 oz / 7 ml fluid cup with lid that is ideal for color mixing. The micro air control (MAC) valve enables incremental control of airflow for an ultra fine to medium spray.